Specimens found in the low intertidal of a Calvert Island beach (close-up at right). Photo by Sandra Lindstrom. 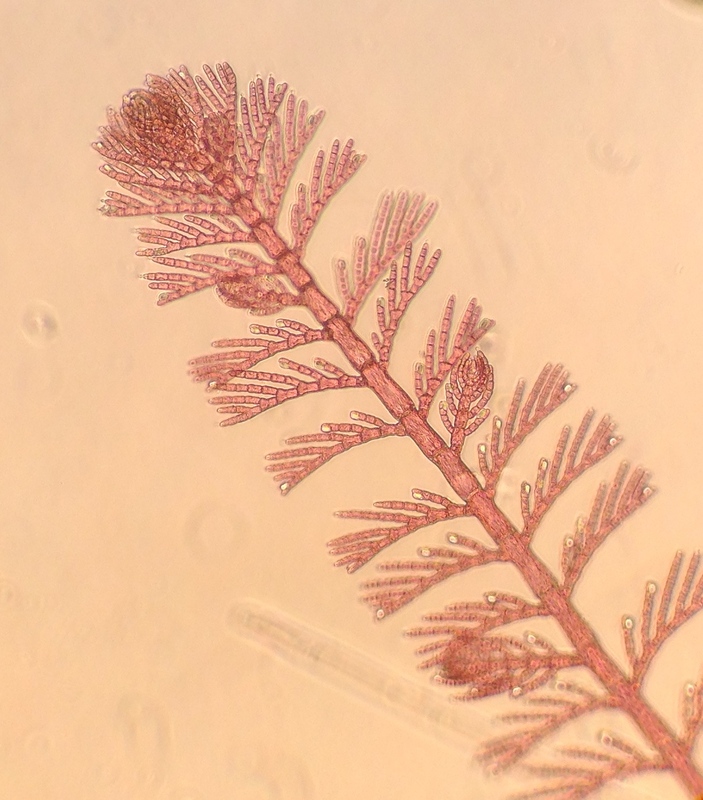 Collection number PTM 492 in the UBC Herbarium Algae Database; search the specimen in the database for more information, or search the species for more occurrences. 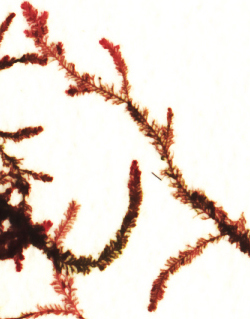 This red alga is small, branched, and dark red, with chains of single cells forming branches. The main branches attach to a prostrate basal branch that anchors the alga to its host or substrate. The lower cells of the main branches are taller than they are wide, and attached to each cell is either a pair of opposite branchlets with determinate growth projects from each cell, or an unpaired lateral branch with indeterminate growth projects from one side of the cell. The last order of branchlets projects from only the upper side of the branchlets. Click here for an image that shows both branch types: 3 unpaired lateral branches with indeterminate growth are visible among the many paired comb-like branchlets with determinate growth. This species reaches 2 cm tall. Dwarf skein is found in the low intertidal and subtidal to a depth of 11 m. It is often epiphytic and grows on variety of algae, as well as on hard surfaces like rock and buoys. Its range stretches from Prince William Sound, Alaska to Baja California in the eastern Pacific, and along the coasts of Russia, Japan, China, and Korea in the western Pacific. It has also been reported along the coast of Brittany in the Atlantic Ocean as well as in the Red Sea. 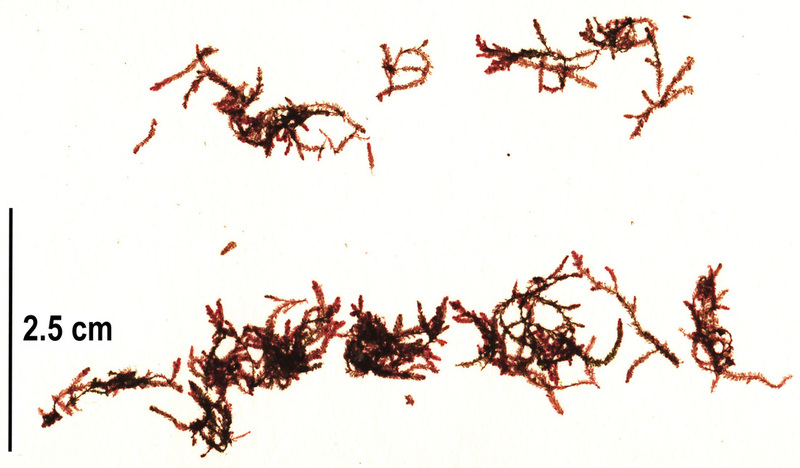 The branching pattern described above helps differentiate dwarf skein from other species of its genus, such as Antithamnion kylinii, and from hooked skein (Antithamnionella pacifica. O'Clair, R. and Lindstrom, S. Antithamnion defectum Kylin. In Klinkenberg, Brian. (Ed.). E-Flora BC: Electronic Atlas of the Plants of British Columbia. Lab for Advanced Spatial Analysis, Department of Geography, University of British Columbia, Vancouver. Accessed 07/04/2015. Stevenson, C. (2005). Antithamnion defectum. Monterey Bay Flora. Monterey Bay Aquarium Research Institute. Accessed 07/04/2015.